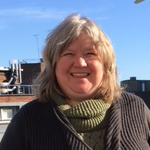 Lyn Burling has been working with LSBU for 10 years as someone with a lived experience and member of the People’s Academy. She has been involved in developing classroom activity that ensures students get the chance to ask those questions they might not feel able to outside of the learning environment. This has been achieved through introducing role play with students, offering them real time feedback on their communication and working as a mentor to students in their leadership and development of service improvements, through for example the Darzi Leadership programme. Lyn has presented at international conference on recovery the work she coproduced with other Peoples Academy members on the impact of engaging with the People’s Academy on recovery and personal wellbeing. Lyn is involved with the nursing courses, and a mentor on the Darzi Leadership programme. Her particular interests are on wellbeing and individualised care planning. She has also delivered teaching on interpersonal skills and communication that is person centred and meaningful. Lyn is undertaking research and evaluation of the People’s Academy activities and the impact that has on wellbeing and personal journeys of recovery.